The Anglican Curmudgeon, a lawyer who has followed the ligitation TEC's national headquarters has filed against departing parishes and dioceses carefully, has posted a marvelous piece today recounting exactly what went on in a Fort Worth courtroom over the last two weeks and what it means for the future course of TEC's lawsuit against my diocese. Read it all here. It is well worth the time. I am feeling better and better about the legal position of our diocese. Dare we hope that PB Schori will finally see the light and negotiate a decent and honorable settlement of this dispute before any more money is wasted? She has not shown any tendency to do so up to this point, but just perhaps the Dennis Canon's complete defeat in South Carolina and the course of events in Fort Worth last week will bring her around to doing the right thing! St. Paul's Cathedral, London, was the site of my conversion experience to the worship and love of the Living God on June 10, 1989. It will always have a special place in my heart and is a priority stop for me each time I am in London. Now we have the capacity to visit it virtually any time we want. Hat tip to Stand Firm. Incidentally, during my pilgrimage to the Holy Land this year I had the great honor to celebrate the Holy Eucharist on an altar in the Greek Orthodox Chapel of Abraham located on the roof of the Church of the Holy Sepulcher just feet from the site of Calvary. That Eucharist took place on June 10th, 2009, twenty years precisely after I first came to know our Savior God in London. That service was one of the greatest experiences of my life. The Lord is good, indeed! Major Ruling in DioFort Worth Court Case!!! The judge has ruled that we had a right to withdraw from TEC last year!!! TEC's alleged "Diocese of Fort Worth" is not the same corporation that has been the diocese for the last 25 years, which still continues to exist under Bishop Iker! THIS IS A BIG WIN FOR THE DIOCESE OF FORT WORTH (ACNA/Southern Cone)! Hat tip to Stand Firm. Pictured above is the Ven. 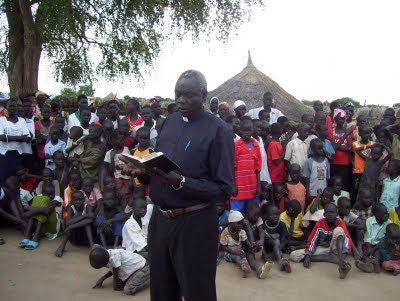 Joseph Mabior Garang, Archdeacon of Wernyol and Archbishop’s Commissary in the new Diocese of Twic East, Sudan, who was shot at the altar of the church in Wernyol during a service of Morning Prayer on Saturday, the 29th of August, 2009. More than forty other innocent civilians were also killed along with Father Joseph during that attack. According to Anglican Archbishop Bui, "the attackers were well armed with new automatic weapons, dressed in army uniforms, and appeared well-organized and properly trained. Instead of attacking a cattle camp, this was an attack on a Payam headquarter town. Consequently in the view of the Church, this was not a tribal conflict as commonly reported, but a deliberately organized attack on civilians by those that are against the peace in Southern Sudan." A full report from the worthy Anglican primate of Sudan may be read at The Anglican Apologist. Father Joseph, pray for us! New Thursday Night Class Starts Tonight! I'm starting my new Thursday night class on the Apostolic Fathers at St. Vincent's Cathedral tonight. Glory! Do please come to class if you can. It will be a boat load of fun! There will be, of course, an offering of Holy Eucharist in St. Mary's Chapel at 7PM, then class will begin in my Middle School classroom at 7:35PM (MS room 103). I hope to see you there!